(Nanowerk News) In hopes of limiting the disastrous environmental effects of massive oil spills, materials scientists from Drexel University and Deakin University, in Australia, have teamed up to manufacture and test a new material, called a boron nitride nanosheet, that can absorb up to 33 times its weight in oils and organic solvents--a trait that could make it an important technology for quickly mitigating these costly accidents. Materials scientists at Deakin University in Australia and Drexel worked together to make a porous nanomaterial that could one day be used to clean up oil spills. The material, which literally absorbs the oil like a sponge, is the result of support from the Australian Research Council and is now ready to be tested by industry after two years of refinement in the laboratory at Deakin's Institute for Frontier Materials (IFM). Alfred Deakin Professor Ying (Ian) Chen, PhD, the lead author of a paper, recently published in Nature Communications ("Boron nitride colloidal solutions, ultralight aerogels and freestanding membranes through one-step exfoliation and functionalization"), said the material is the most exciting advancement in oil spill remediation technology in decades. "Oil spills are a global problem and wreak havoc on our aquatic ecosystems, not to mention cost billions of dollars in damage," Chen said. "Everyone remembers the Gulf Coast disaster, but here in Australia they are a regular problem, and not just in our waters. Oil spills from trucks and other vehicles can close freeways for an entire day, again amounting to large economic losses," Chen said. The Australian Research Council supported the development of the boron nitride nanosheets, because, according to Chen, current methods of cleaning up oil spills are inefficient and unsophisticated--taking too long and causing ongoing and expensive damage. The nanosheet is made up of flakes, which are just several nanometers (one billionth of a meter) in thickness with tiny holes. This form enables the nanosheet to, in effect, increase its surface area per gram to the size of five and a half tennis courts. The pores found in boron nitride nanosheets allow them to absorb more than 33 times its weight in oil and organic solvents. According to lead author, Weiwei Lei, PhD, an IFM scientist and an Australian Research Council Discovery Early Career Research Awardee, turning the powder into a sponge was a big challenge--but an essential step in the process. "In 2013 we developed the first stage of the material, but it was simply a powder. This powder had absorption capabilities, but you cannot simply throw powder onto oil - you need to be able to bind that powder into a sponge so that we can soak the oil up, and also separate it from water," Wei said. "The pores in the nanosheets provide the surface area to absorb oils and organic solvents up to 33 times its own weight." Researchers from Drexel's College of Engineering helped to study and functionalize the material, which started as boron nitride powder, commonly called "white graphite." By forming the powder in to atomically thin sheets, the material could be made into a sponge. 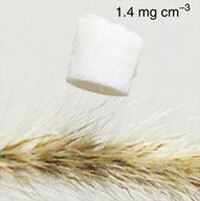 "The mechanochemical technique developed meant it was possible to produce high-concentration stable aqueous colloidal solutions of boron nitride sheets, which could then be transformed into the ultralight porous aerogels and membranes for oil clean-up," said Vadym Mochalin, PhD, a co-author of the paper, who was a research associate professor at Drexel while working on the project, and is now an associate professor at Missouri University of Science and Technology. 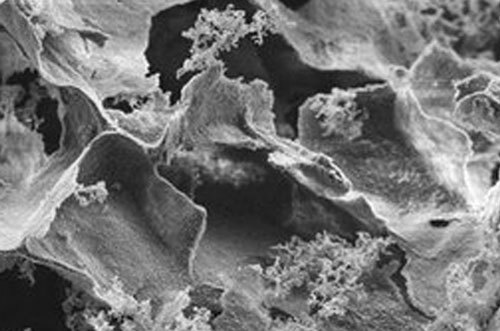 The Drexel team used computational modeling to help understand the intimate details of how the material was formed. In the process, the team learned that the boron nitride nanosheets are flame resistant--which means they could also find applications in electrical and heat insulation. "We are delighted that support from the Australian Research Council allowed us to participate in this interesting study and we could help our IFM colleagues to model and better understand this wonderful material, " said Yury Gogotsi, PhD, Distinguished University and Trustee Chair professor in Drexel's College of Engineering, and director of the A.J. Drexel Nanomaterials Institute. The nanotechnology team at Deakin's Institute for Frontier Materials has been working on boron nitride nanomaterials for two decades and has been internationally recognized for its work in the development of boron nitride nanotubes and nanosheets. This project is the next step in the IFM's continued research to discover new uses for the material. "We are so excited to have finally got to this stage after two years of trying to work out how to turn what we knew was a good material into something that could be practically used," Chen said.